The Lanair MX Series Boiler is designed for applications requiring a high efficiency, compact hydronic boiler. Cast iron sections are fully assembled, the rugged swing door exposes all heating surfaces for direct visual inspection and facilitates maintenance. Circular water backed furnace design requires no refractory combustion chamber. The Lanair MX Series Boiler is designed for applications requiring a high efficiency, compact hydronic boiler. Cast iron sections are fully assembled, the rugged swing door exposes all heating surfaces for direct visual inspection and facilitates maintenance Circular water backed furnace design requires no refractory combustion chamber. The supply manifold speeds installation and simplifies placement of controls. The unique 3-pass "Scotch Marine" Design delivers high operating efficiencies and it's responsiveness is unmatched due to the relatively low mass and low water volume. The MX Series Boiler is designed for commercial applications requiring an efficient and responsive hydronic heating boiler. 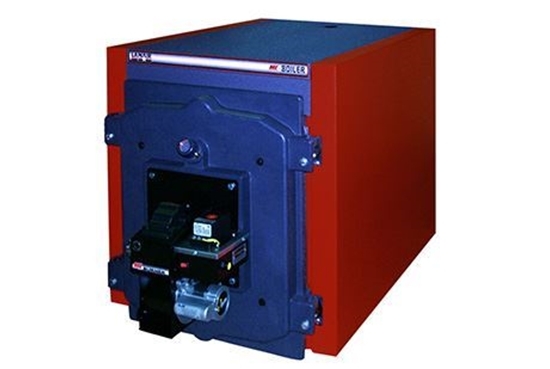 The compact size permits multi-boiler modular installation for larger heating loads. Three-Pass "Scotch Marine" design: The flame travels through three passes which are under positive pressure, maximizing the heat transfer to boiler water and allowing very little chimney heat loss. Hinged Front Door: Instant access to burner and fire box to minimize maintenance time. Exclusively designed for forced hot water circulation, which minimizes thermal shock.